Whole Space includes both the Queen Ensuite Room and King/Twin Room with private bathroom (not ensuite), kitchen/dining/ living room area, private covered verandah, 2 offstreet undercover parking spaces, own private entrance, level access, use of back garden and Garden Retreat. The Friendly Chat Bed and Breakfast offers a choice of 2 bedrooms, each with its own private bathroom, and as such is suitable and affordable for people travelling alone, couples, small groups or families. So why not come and experience this relaxing, restful home-away-from-home accommodation, kick up your feet and enjoy our hospitality? All prices are in $AUD and daily rates are based on 1-2 night stay. For longer stays , reduced daily rates may apply. Breakfast can be supplied at a cost of $17.50 per person per day. 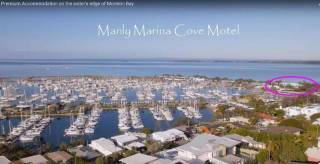 The Friendly Chat is located one block back from the edge of Moreton Bay at Thorneside. It is in a quiet, leafy neighbourhood that offers relaxing walks by the bay, with picnic and recreation areas only a short stroll away. Shopping centres are in close proximity to the B&B, five minutes drive away. Off street, undercover parking is available, and the bus goes right past the door. Rail Thorneside Railway Station is close by, with the regular train service from Cleveland offering air conditioned comfort to the city of Brisbane (40 mins). Air Travel – Brisbane Domestic and International Airports are about a 20 min drive away. A rail link can take you from the airport to Brisbane City, where a Cleveland Line train will bring you to Thorneside or Birkdale Stations.